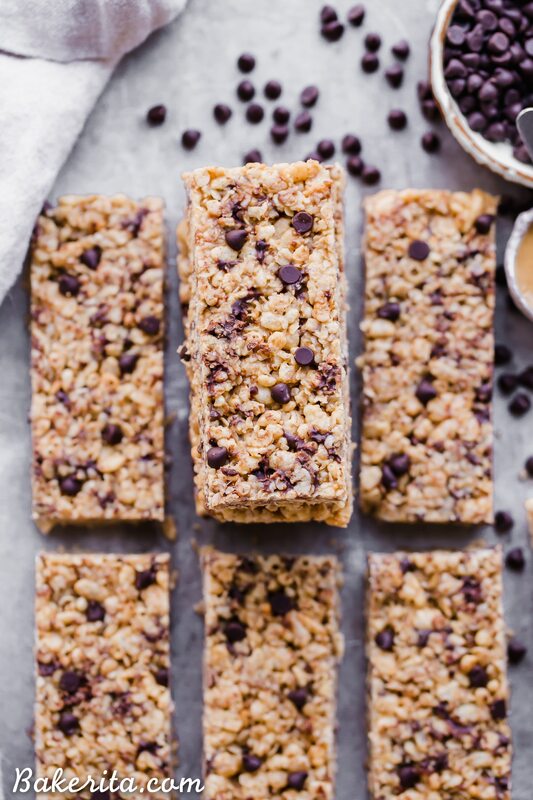 These Peanut Butter Chocolate Chip Chewy Bars will bring you right back to your favorite childhood snack! This homemade, no-bake version is way more delicious with a short and simple ingredients list. They’re gluten-free and vegan, too! Do you guys like/remember Chewy Bars? They were a staple in lunchboxes when I was growing up and I remember loving them – they were so chewy and delicious. I particularly partial to the peanut butter chocolate chip flavor because obviously, I’m always gonna that combo if it’s an option. I was browsing the deep depths of my archives the other day and rediscovered this old gem of a post, Peanut Butter Chocolate Chip Chewy Granola Bars, back from my college dorm room days. At the time, I was keeping Bakerita alive with a little something I called “Dorm Room Eats” – recipes most college students could make with basic ingredients in the microwave. They were so good, and I used to make them all the time. I forgot all about them until I saw the post again recently. 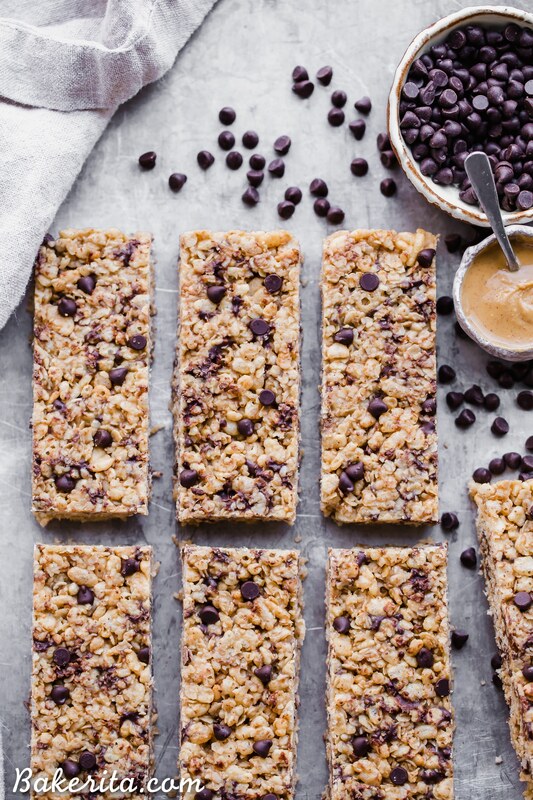 I decided it was time to revisit the good old Peanut Butter Chocolate Chip Chewy Bar and revamp it a little bit, giving it some new life and extra love. I made changes to the recipe to make it completely refined sugar-free and vegan since my last version used brown sugar and butter. Now, we’re using coconut oil and maple syrup. I tested it with honey as well, but I preferred maple syrup’s more mild flavor. 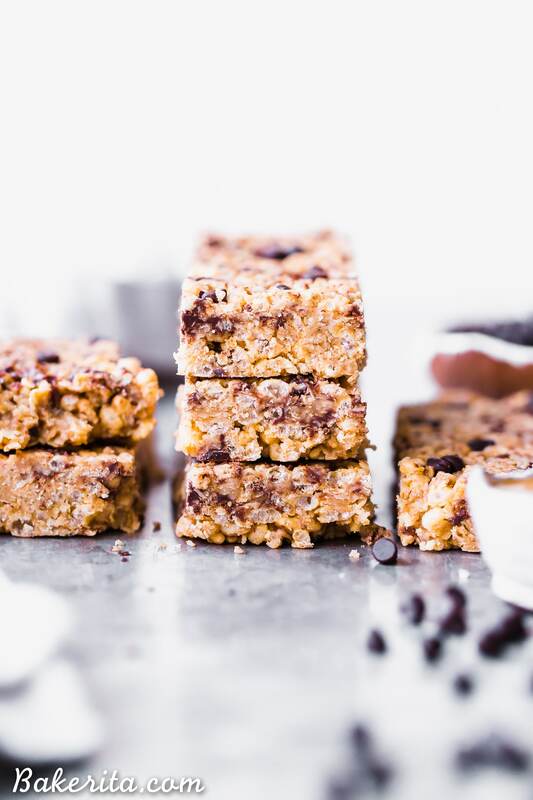 The crispy, crunchiness of the bars comes from crispy brown rice cereal. I tested it with a couple different kind’s and Barbara’s was my fave because it stayed the crispy-crunchiest for the longest. Besides the cereal, the only other dry ingredient is quick cooking oats. The coconut oil and maple syrup are brought to a boil for a minute, and then the peanut butter, vanilla and salt are stirred in, and it’s all mixed with the cereal and oats. Easy as that! Chocolate chips are stirred in last, and then pressed into the pan. 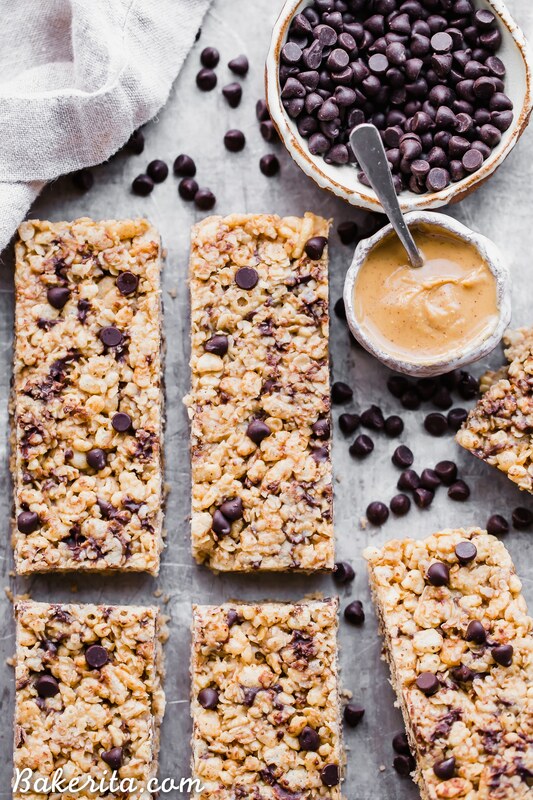 These Peanut Butter Chocolate Chip Chewy Bars will bring you right back to your favorite childhood snack! This homemade, no-bake version is way more delicious with a short and simple ingredients list. They're gluten-free and vegan, too! ⅓ cup (104g) maple syrup I also tested with honey and that worked too, but not vegan! In a small sauce, stir together coconut oil and maple syrup. Heat over low-medium heat until it starts boiling, stirring frequently. Once it begins to boil, let boil for 1 more minute. Remove from heat and stir in peanut butter, vanilla and salt until smooth. Pour hot mixture over dry ingredients and mix until thoroughly combined. Stir in the mini chocolate chips. Working quickly, so the chocolate doesn't melt, pour into a parchment-lined 8x8 pan and let set in the refrigerator for about an hour, or until set. Cut into 12 bars and store tightly wrapped in plastic wrap or in an airtight container in the refrigerator for 2-3 weeks. These bars will get softer and a little crumbly when they're stored at room temperature for too long, so make sure to keep them chilled! 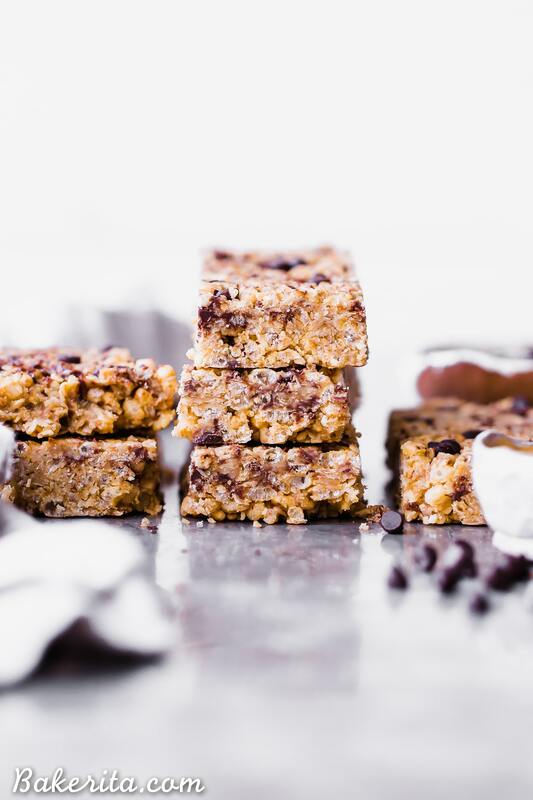 Hello-the recipe tastes great but I can’t get the bars to stay together–as soon as they warm up they totally fall apart. Any tips to fix this? Hi Liz, they do need to be kept cool to stay together well, that’s why I mention keeping them stored in the refrigerator. I’ve brought bars to friends though and found if they’re wrapped tightly in plastic wrap, they’ll hold together better. Use honey or rice malt syrup, and they’ll hold together just fine. Can you use Old Fashioned Oats or do they have to be quick cooking? These are really good. Followed the vegan recipe. My chips melted but that was ok. I just added a few more. Yes they fell apart a little when warmed up but I loved them. I also love peanut butter which is probably why I like them so much. Thanks for the recipe and everyone’s tips. So glad you enjoyed them, Megan! Thanks for the feedback.